Synchronization. Automatically keep your library in sync across different PCs. If you have access to WebDAV storage, synching can also include your attachments. Automatic backup. A copy of your library is stored safely on the synchronization server. More than 1100 CSL citation styles. The style repository has grown immensely due to community efforts. 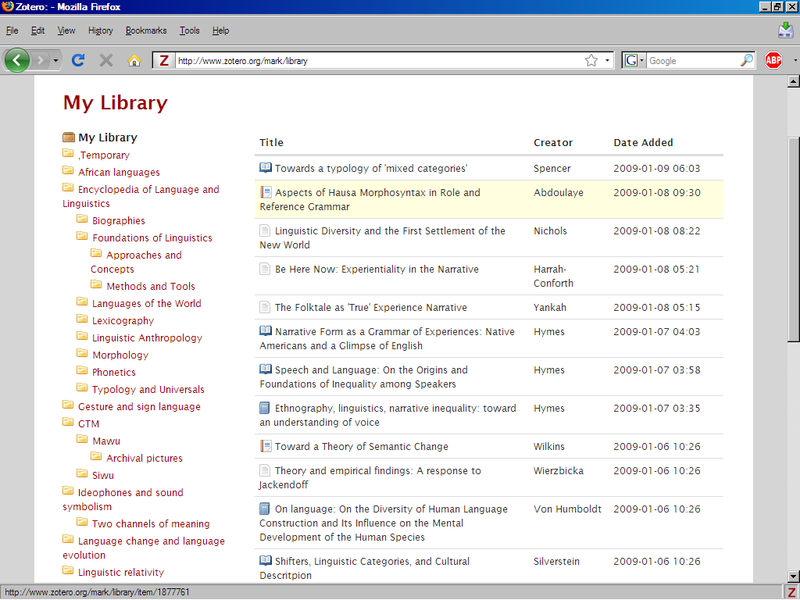 Zotero styles are built on the powerful open source Citation Style Language (CSL), an XML dialect. Support for EndNote styles. Thousands of EndNote .ens styles can now be used for citation formatting. These styles are available to licensed users of EndNote. Rich text notes. Formatting can now be applied to notes with a WYSIWYG editor. Automatic detection of PDF metadata. Another much requested feature. Not yet bulletproof because it depends on the information available in your PDF and the repository used to look it up, but a great step forward. Shared collections. Easily share and build collections with colleagues. All of this built on open source technologies and standards, which means that your data is not locked up in proprietary software at the mercy of profit driven companies. 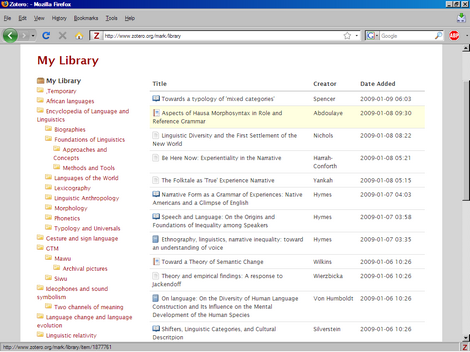 Meanwhile, the Zotero website has seen a major revamping, the most important new feature being the ability to browse your library online. Other features are more geared towards social networking activities: users now can have an online Zotero profile, can follow other Zotero users, and can build an online CV. If you’re still stuck on EndNote, check out making the switch to Zotero, or see my review and comparison from last year. Questions? There are lots of helpful and friendly people hanging out in the Zotero forums. You can also post them below. I think What they need now, is a bookmarklet so that we can add references to our collection when not at home, where I cannot install zotero. Here’s a tip if you don’t have access to a WebDAV server but would like to sync your attachments: mydrive.ch offers 2GB of WebDAV space for free (! ); including SSL, and buying more space isn’t expensive. Question: how do you handle publications that have originally been published in say 1753, and of which you have a 1910 reprint? There’s no ‘Original publication date’ field, and if you use ‘1910 ’, Zotero will use just ‘1910’ when you generate your bibliography. Interesting blog, by the way! Arjan, the Citation Style Language that underlies Zotero’s citing capabilities already supports something like original-date, but it hasn’t been implemented in Zotero itself yet. See this thread on the forums and this ticket on Trac. There is no workaround right now, so if you’re citing such works you’ll have to edit the dates manually to add in the original date like 1983.